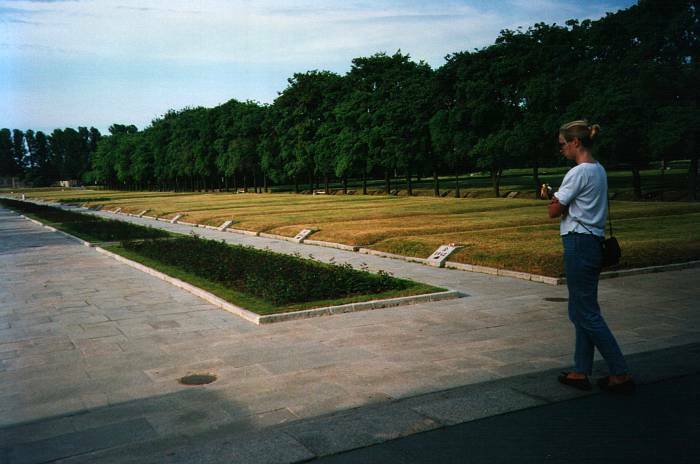 This is the spectacular plaza between the semicircular General Staff Building and the Hermitage. The Hermitage, the Эрмитаж or Ermitazh, is one of the oldest museums in the world. 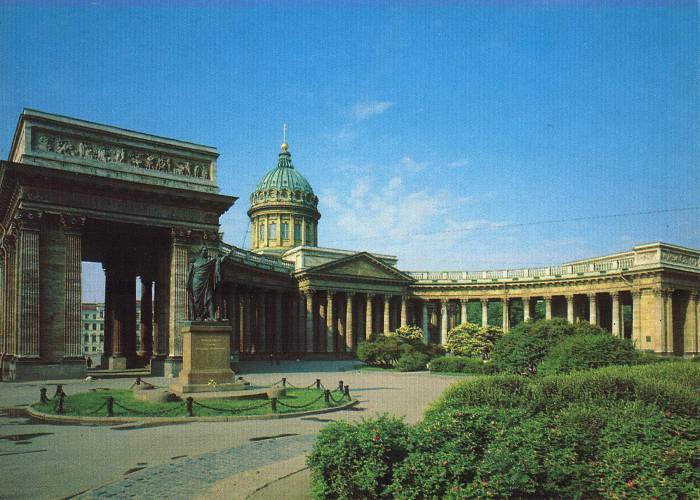 Catherine the Great founded it in 1764 as her personal collection, and it has been open to the public since 1852. 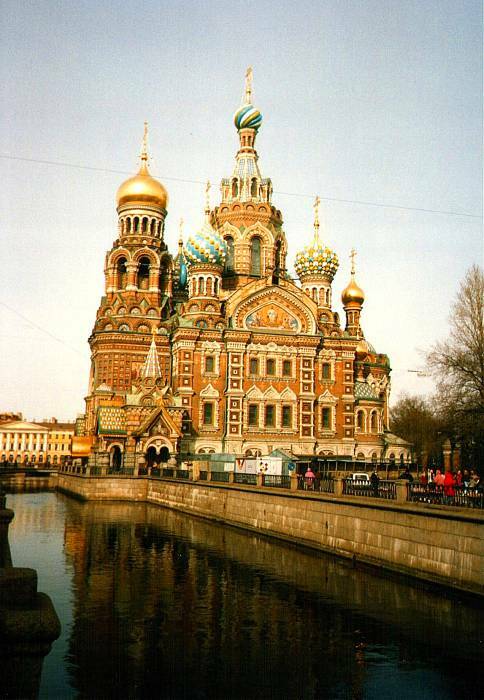 It occupies a complex of six palaces along the Neva River. 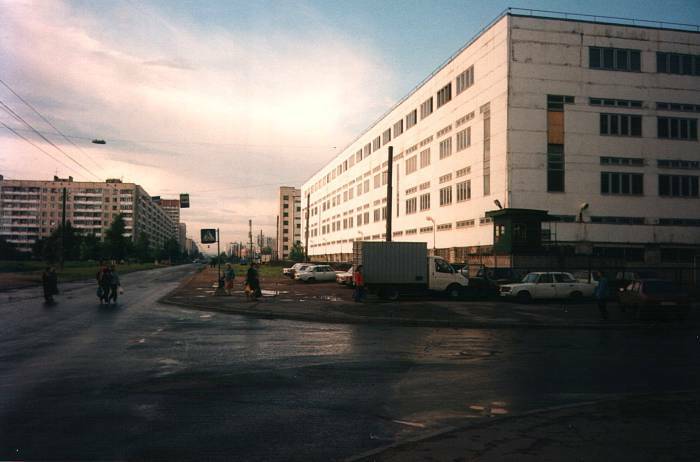 The General Staff Building, the Здание Главного Штаба or Zdanie Glavnovo Shtaba, is an enormous building facing the Hermitage across Palace Square. Its semicircular façade is 580 meters long. 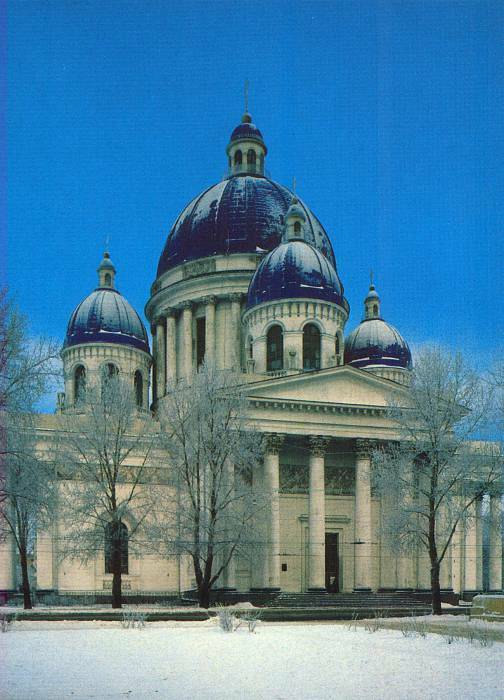 It was build in 1819-1829 to commemorate the Russian victory over Napoleon in the Patriotic War of 1812. It was the headquarters of the General Staff, the Foreign Ministry, and the Finance ministry until the capital was moved to Moscow in 1918. Above you see the view from one of the upper floors of the Hermitage. Yes, we're lookign out an open window in one of the world's greatest art museums. The infrastructure is a bit faulty. 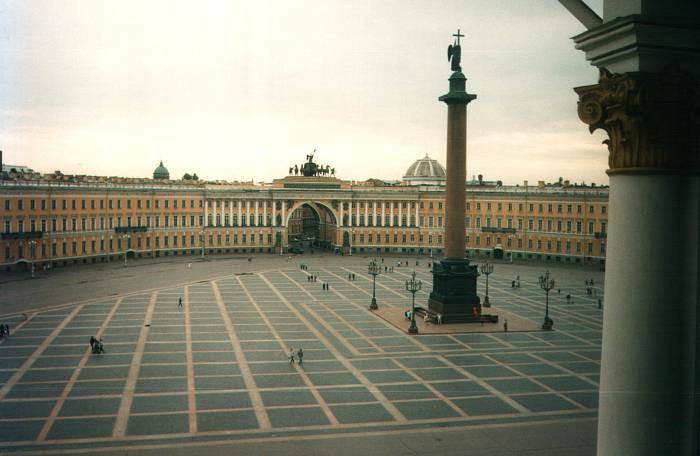 Notice the Aleksandr Column at the center of the plaza. 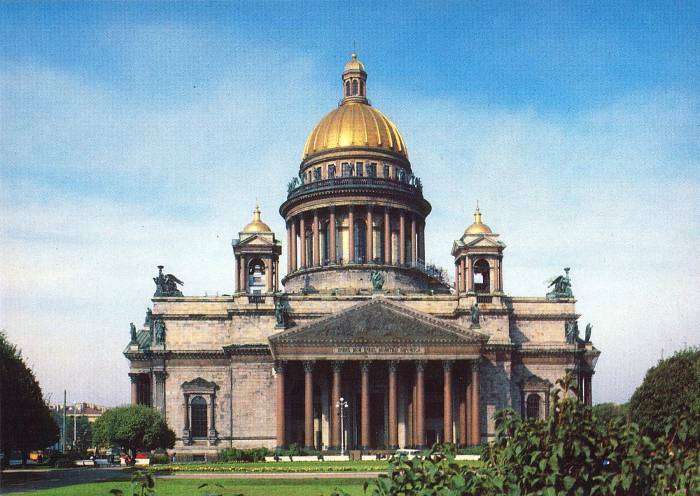 It was erected after the Russian victory over Napoleonic France in 1812. The entire monument is 47.5 meters tall, largely made up of one piece of red granite 25.45 meters long and weighing 600 metric tons. It's topped by a statue of an angel holding a cross. 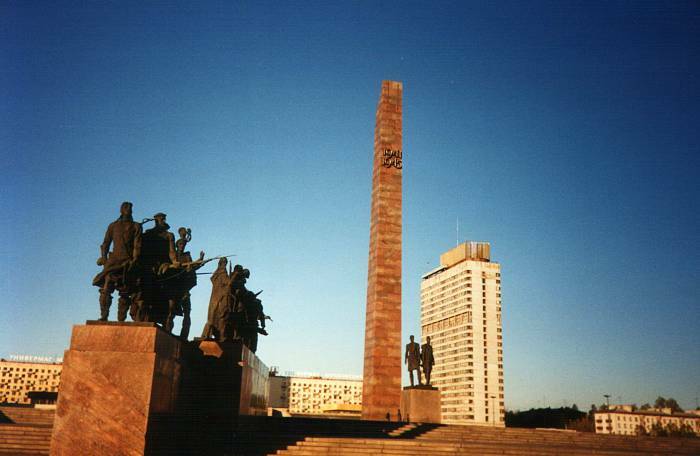 The Aleksandr Column is the largest free-standing monolithic monument in the world. See how it dwarfs the people standing below it. But it is dwarfed in turn by the scale of the plaza and the dramatic buildings around it. 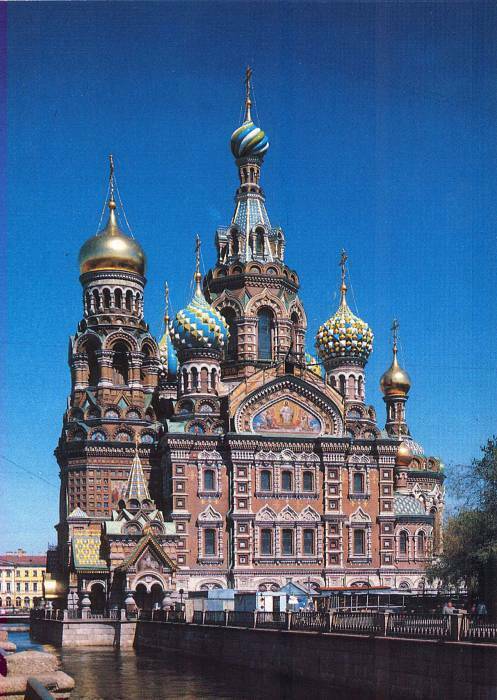 This is the Church of the Resurrection on the Spilled Blood. 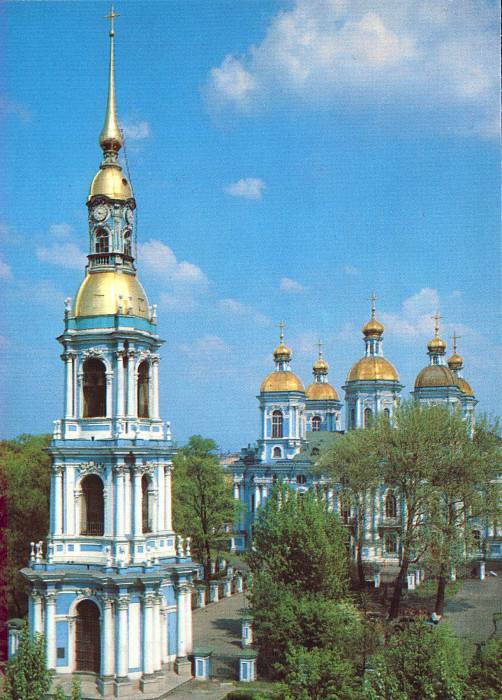 The Church of the Resurrection of Christ, Built Where a Czar's Blood Was Spilled. 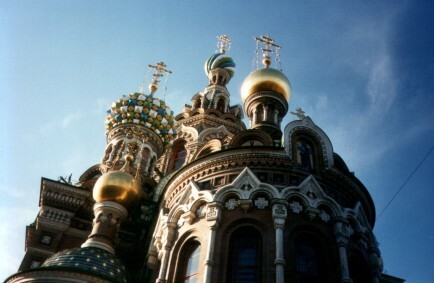 Onion domes, gilding, multicolored ceramic tiles, intricate brickwork. 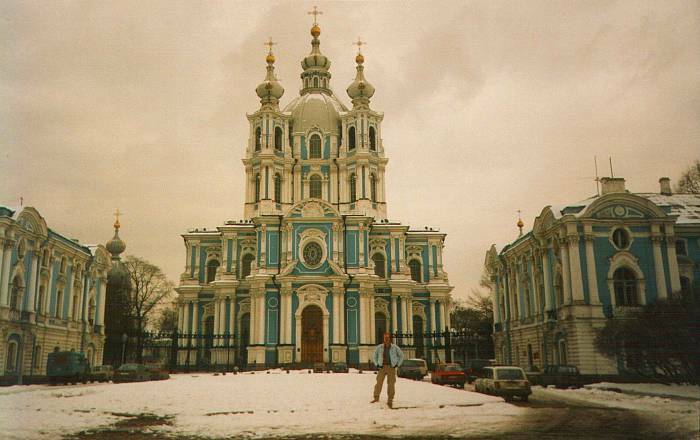 Built in the style of St Basil's at one end of Red Square in Moscow. But built much later, in the mid-1800s. 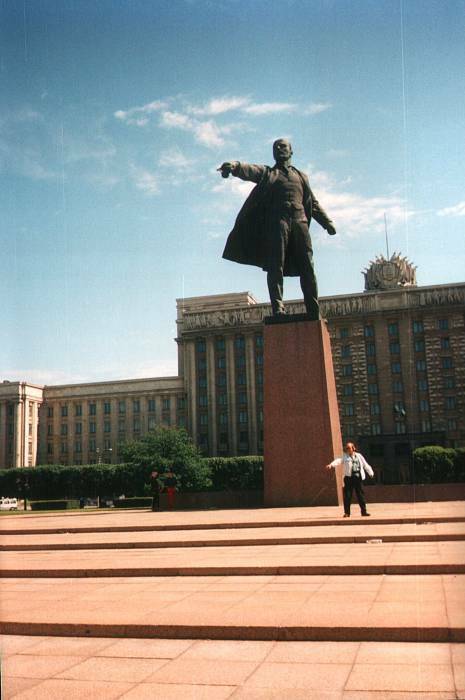 Yes, there are still a few statues of Vladimir Ilych Lenin, born Vladimir Ilych Ulyanov. he took the pseudonym "Joe Steel". he took the pseudonym "Of The Hammers". 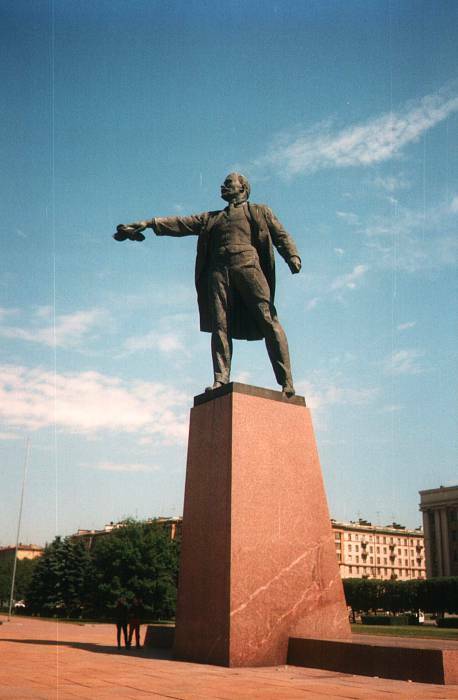 Here's a statue the locals call "Lenin Hailing a Cab". I try it with no greater success. There is a great memorial in a traffic circle near the southern edge of the city. 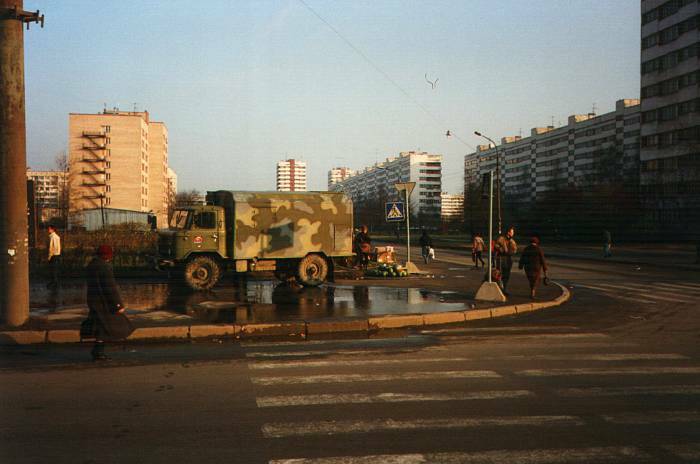 It's in the main road south toward the airport. 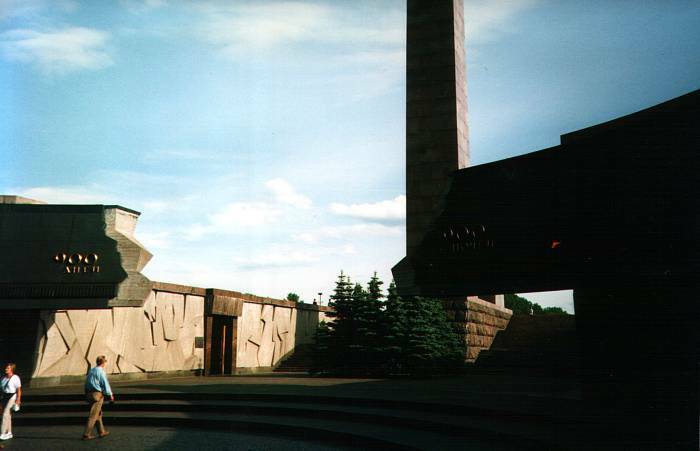 It commemorates the Siege of Leningrad during World War II, known there as the Great Patriotic War. The siege lasted from 8 September 1941 to 27 January 1944 — 872 days. It was the deadliest siege of a city in history. An estimated 1.5 million people died. 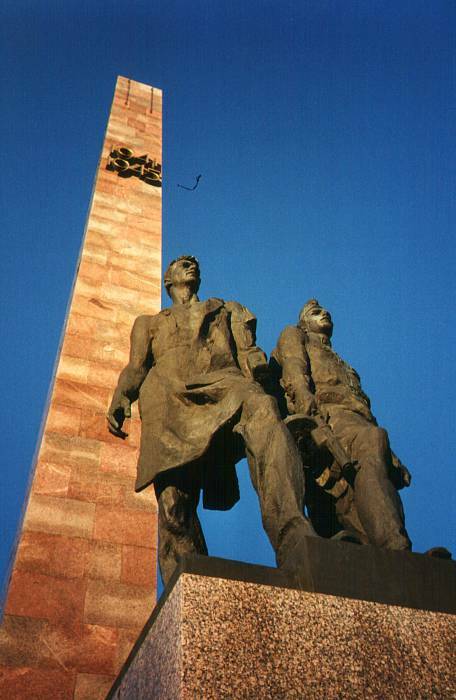 Statues and a tall monument are visible from out on the traffic circle. In the center are a series of memorials outside, and a very nice museum underground at the center. USAID/AIHA made sure that everyone saw the palaces, art museums, and ballet. I would drag everyone to this memorial. Americans are generally very unaware of what the Russian people went through, and how important the Russian front was in World War II. Nearby is a cemetery with long rows of mass graves. Not too far away there's a new church. 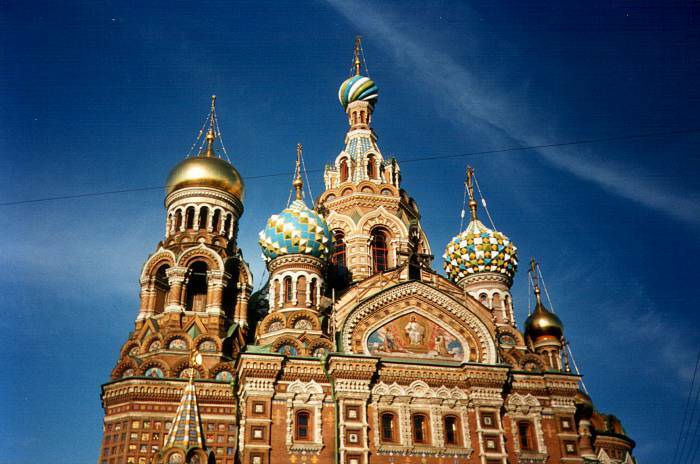 It's built in a classic Russian style, with intricate woodwork. The new icons are done with the writing in Russian instead of the classic Old Church Slavonic. That way the people can read them — they can read the names of the figures on the icon and read any text in what they're holding. The Louisvilniki would always see performances by the ballet and symphony. 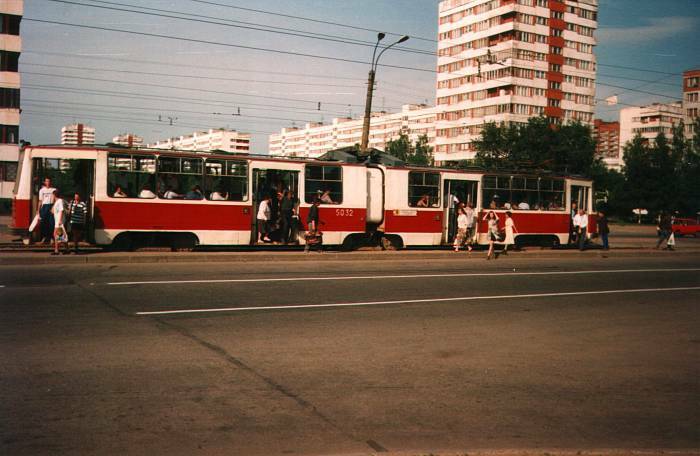 I went on the first few trips — it was great! 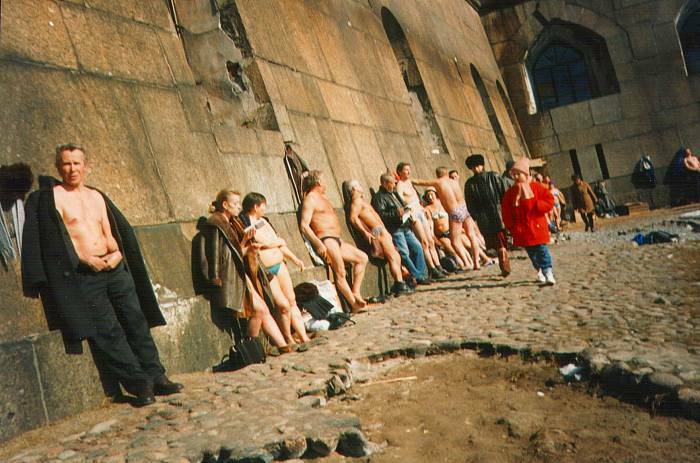 However, many of the Russians we worked with had no opportunity to see their own culture any more. So, I would give my ticket to one of them and wander the neighborhood for an evening of nekulturny kultur. Culture for me, the uncultured, you see. Here is the milk truck. 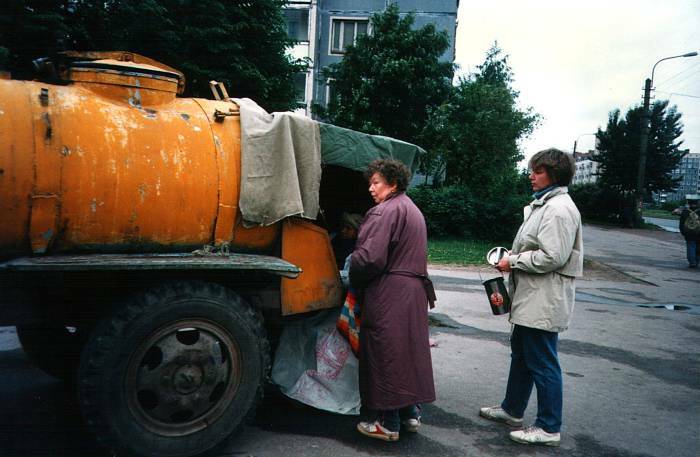 A tank truck sometimes labeled МОЛОКО, moloko, sometimes not labeled. But the women lined up with containers was a giveaway. Shipping containers are vital components of architecture, business, and more. They're sturdy, lockable, and somehow available. There is a booming underground market in used shipping containers that, ah, fell off a ship somewhere. Elite people in a nearby neighborhood of nice houses used them as garages. Some markets filling a large lot are made from rows of them. Here someone has opened a shoe-repair shop in a shipping container. See the container neatly labeled РЕМОНТ ОБУВИ (remont obuvi, or repair of shoes). 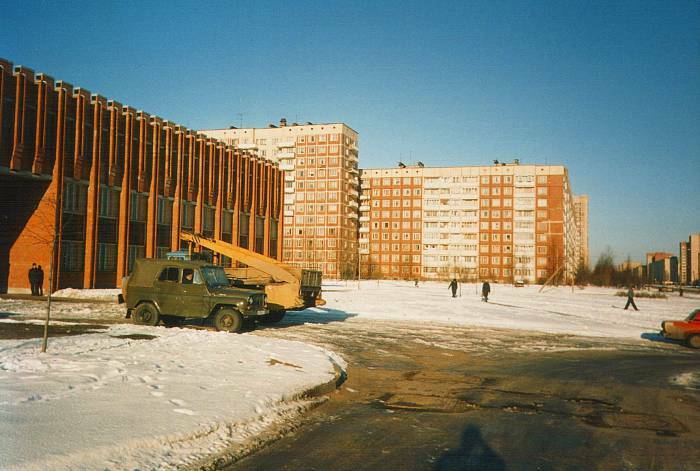 To the right is a side entrance to an apartment building, #15 Lunacharskovo. To the left is a bunker-like place with space for a couple of businesses. All that operated there was a liquor store that did a booming business. One time I had some athlete's foot and wanted some rubbing alcohol to make it quickly go away. 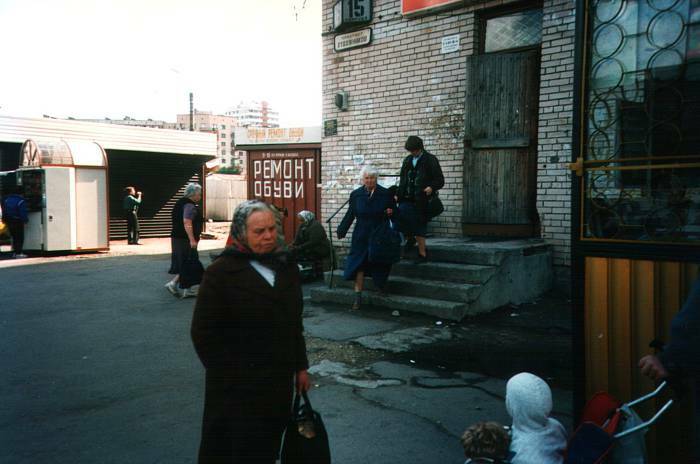 I found the local apteka or pharmacy at the sign saying Аптека. But when I asked for alcohol, I got a shocked look and was told to leave. In my Tarzan Russian I insisted that "I would like some isopropanol, because there is a fungus with my feet." But I was told to get out. I then realized that they just assumed I wanted to do like some of the locals and drink wood alcohol, to quickly become intoxicated, blind, and dead, probably in that order. Fine. I went to the above liquor store to buy some cheap vodka to use as disinfectant. I had to stand in line at 10 AM on a weekday, but I got it. The fungal infection quickly went away. The cleaning woman at the hotel saw the bottle in my room one day. She got worried, and asked if I was drinking it. "No, no, it's for my feet. You see, they had a fungus." She poured a little into the bottle's cap and tried to light it on fire. "Ah, this would be good to drink." It hadn't burned with a crackling flame like the more dangerous versions of samogon. Some of the Louisvilniki would buy vodka to use to disinfect their toothbrushes. The alternative was to brush your teeth with gassy bottled water, which produced a rabies-like effect. 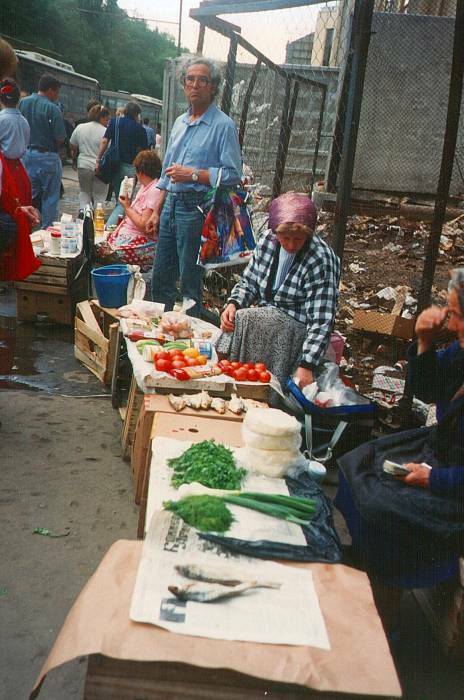 Here's another street market. Vegetables and dried fish in this section. 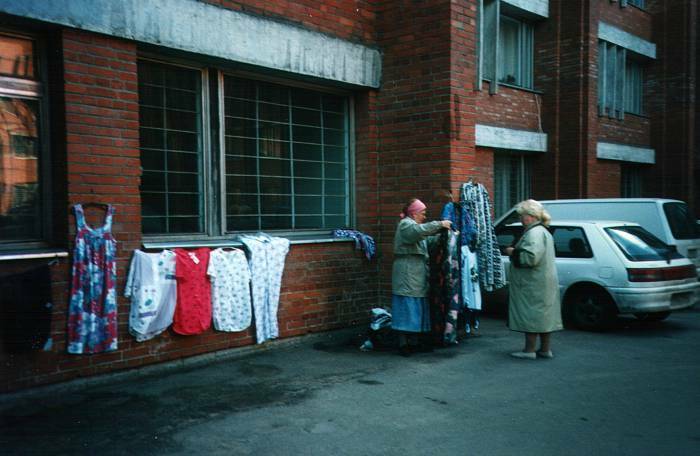 One day I was looking through a street market, and saw the grandmothers selling typical things. Vegetables, dried fish, balls of string, little girls' dresses, and so on. One of them had what looked like a somewhat clunky, black, hand-held vacuum cleaner, what's marketed as a "Dustbuster" in the U.S. But looking closer, I realized that it was a radiation detector! The grandmother thought she had an interested buyer, and started showing me its features. "No, no, thank you, Grandmother. 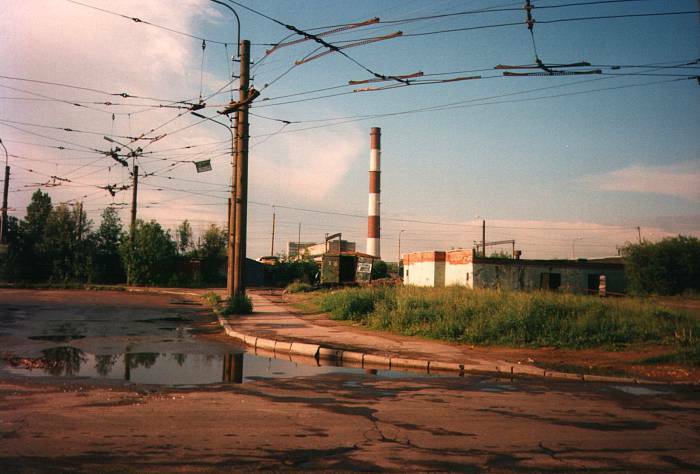 It's a very nice detector of nuclear materials, but I don't really need one right now." Walking down the street, I saw another for sale. And another after that — about one per block! Back at our place during dinner that night, the Louisvilniki were talking about what they had done that day. Some had been taken to a nice tea party. Others had been taken into the city to a small art museum. 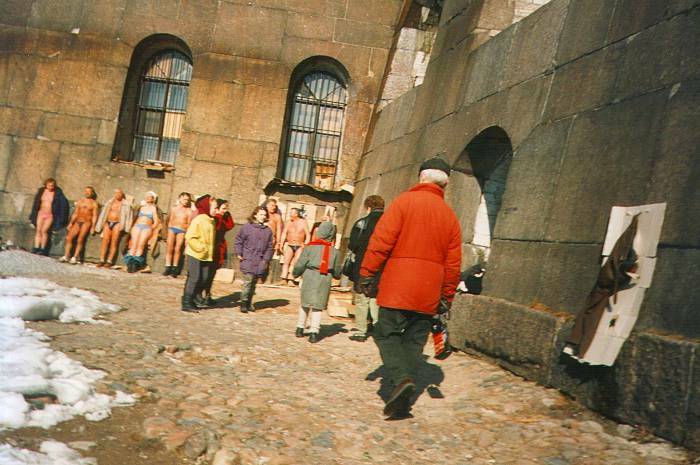 And what had been on my nekulturny exploration? 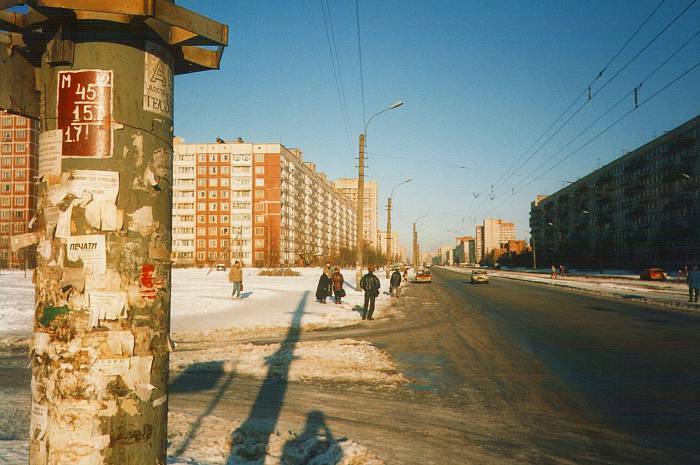 "I noticed that a lot of the babushki along the street are selling hand-held radiation detectors. What's the story behind that?" Ah. That's much more interesting than the ballet! I am not making this up, see the New York Times article about this — "The Kick in the Fruit Punch Could Be Atomic". 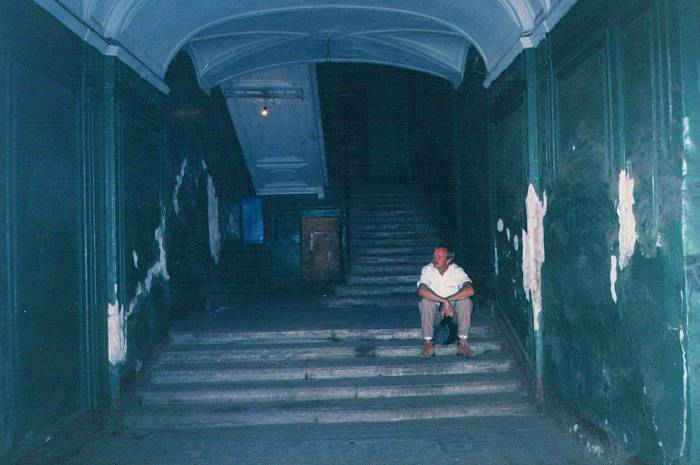 The apartment buildings tend to be pretty grim inside. The hallways and stairwell, anyway. But once behind the heavy and multiply-locked doors, the apartments are nice. An enterprising woman has set up an informal clothing shop on the side of the hospital. Literally on the side of the hospital. Someone has commandeered a military truck for use as a vegetable stand. 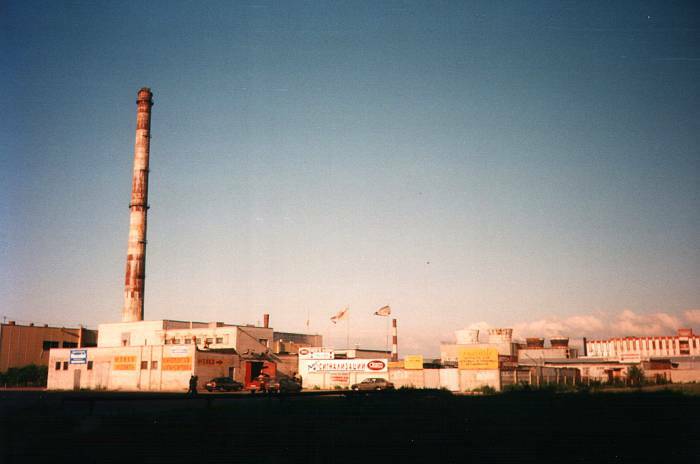 Walk far enough and you leave the apartment blocks for some factories. Time to wander back into the housing district along a different route. Here is a streetcar on a sunny and dry day. First, go to a kiosk and buy a ticket made from coarse pulp paper, grey with wood chunks. When you get on board, you must validate the ticket. Or unvalidate it, or cancel it, or whatever. The point is, you put the ticket into a wall-mounted punch and press the handle. That perforates the ticket with a pattern specific to the punches on that car. So, a ticket inspector could verify that you have paid for this specific ride — you purchased a ticket and punched it in this streetcar. "You say that you are the streetcar ticket inspector? Hah! I am the streetcar ticket inspector! And where is your validated ticket?" Or just wait for the babushka sitting on the bench to start beating him with her bag while berating him for trying such an obvious scam. Once you have paid for your ride, you can just keep riding to see where the line goes. Wow, what a confluence of streetcar lines and overhead power wires! What's back this way? Ah. It's the streetcar repair yard. Well, that's interesting! 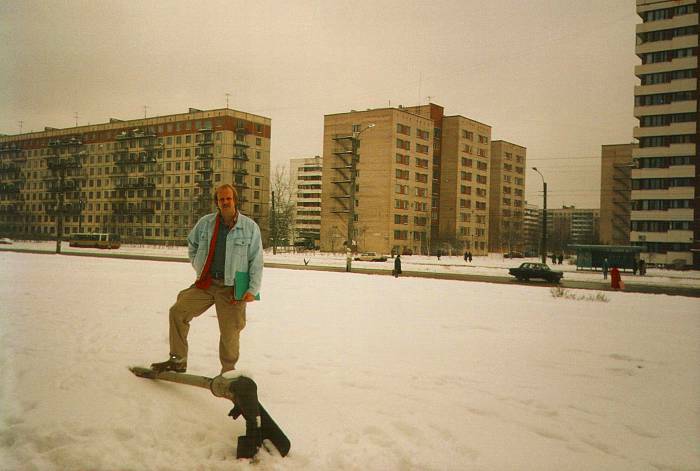 Lots of Americans have been to the Russian ballet. 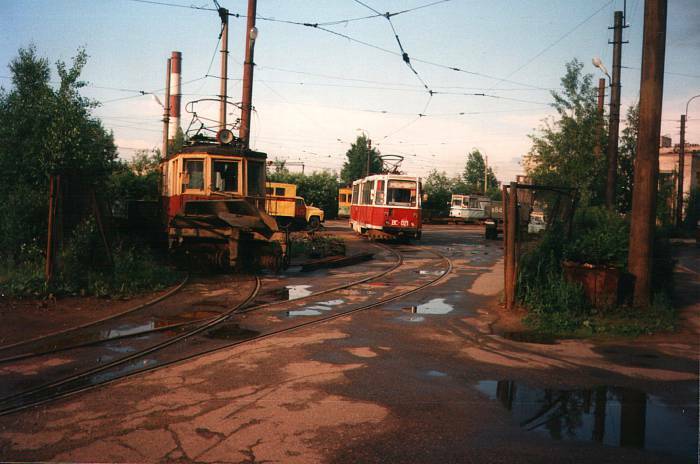 But how many have been to a Russian streetcar repair yard? Now I'm back in the neighborhood. This is the Universam, or supermarket. 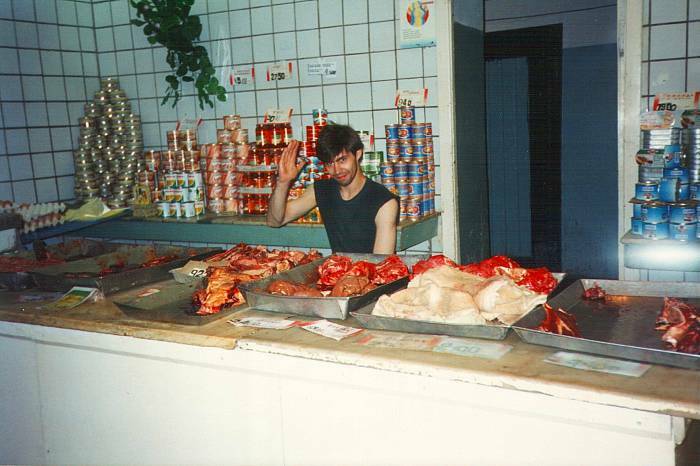 And here's the meat counter. 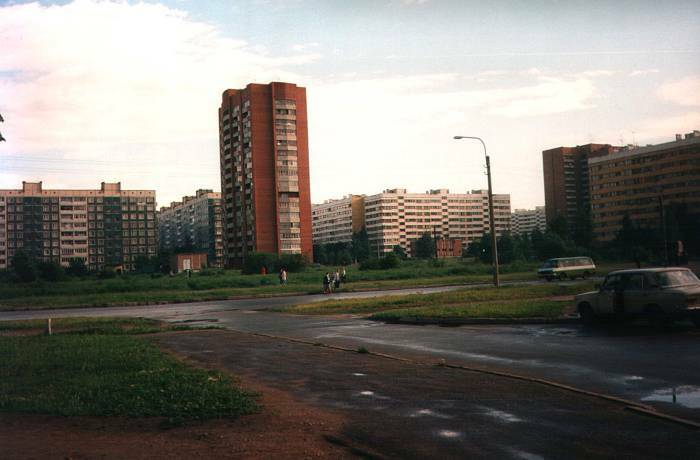 And even more apartment blocks. Here I am leaving for work one day in late October. At the main entrance of the hospital. Looking down Lunacharskovo Prospekt on a sunny morning in March. 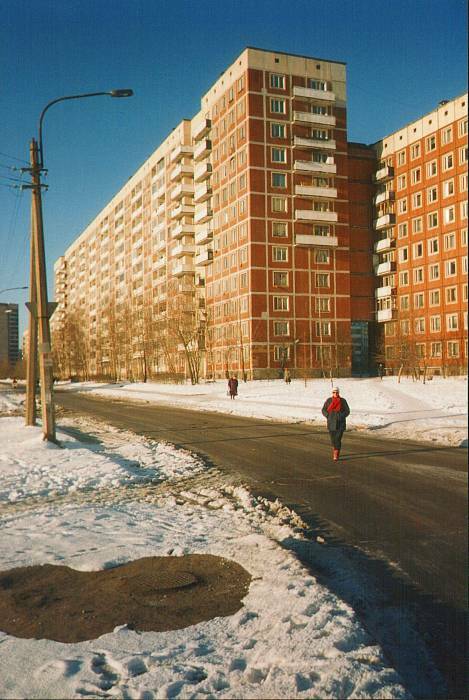 Apartment blocks across the side street from where we stayed. Where we stayed, at left, behind the jeep and crane. 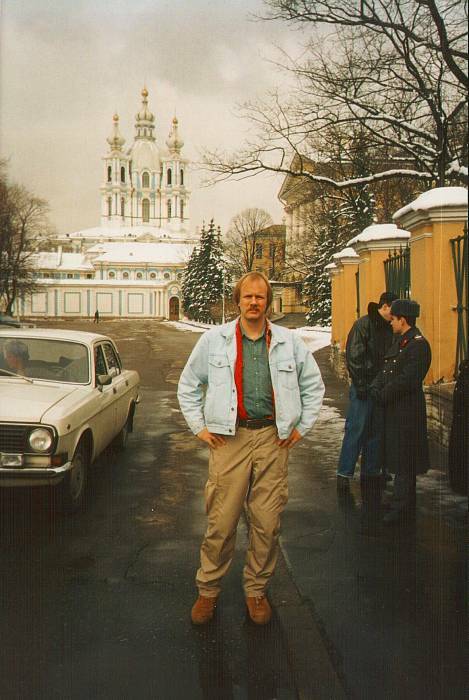 Here I am at the entrance to the Smolny Convent of the Resurrection. 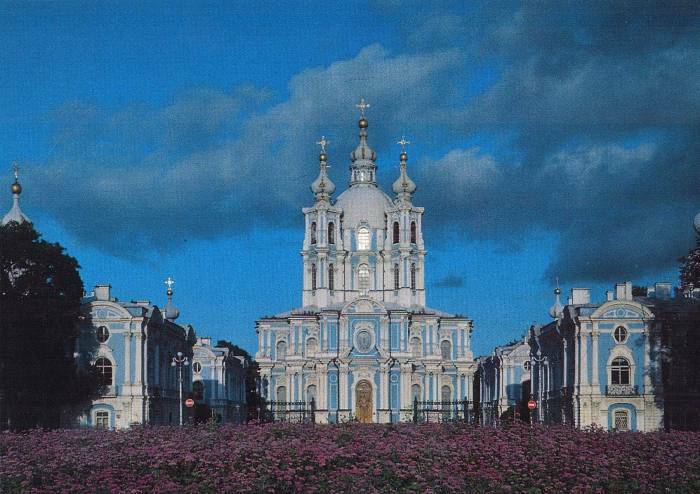 The Smolny Convent was initially built as a Russian Orthodox monastery for nuns, meant to house Peter the Great's daughter Elizabeth. She had decided to become a nun. But her predecessor Ivan VI was otherthrown by the royal guards in a coup in 1741, and Elizabeth decided to take the throne. The adjacent Smolny Institute was built in 1806-1808 to house the Smolny Institute for Noble Maidens. 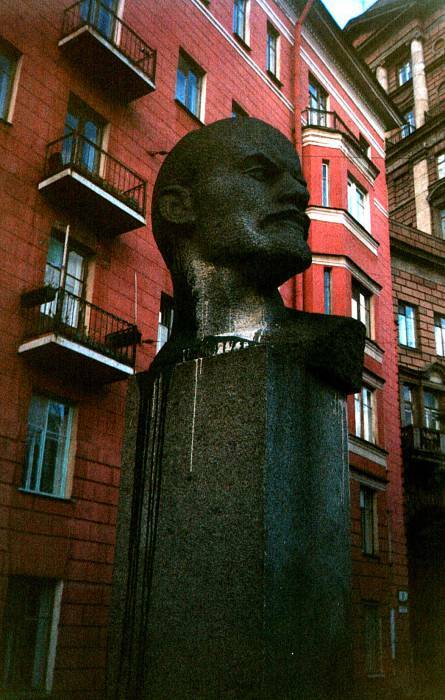 It was made the Bolshevik headquarters under Vladimir Lenin during the 1917 October Revolution. 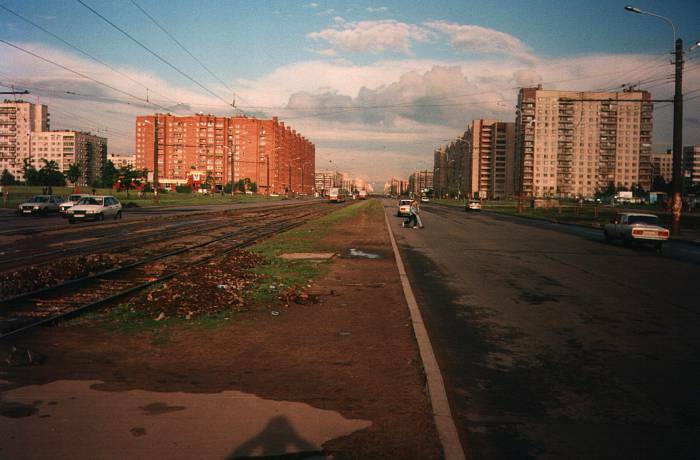 Lenin lived there for several months, until the newly formed government moved to the Kremlin. The Smolny Institute remained the city's Communist Party headquarters. 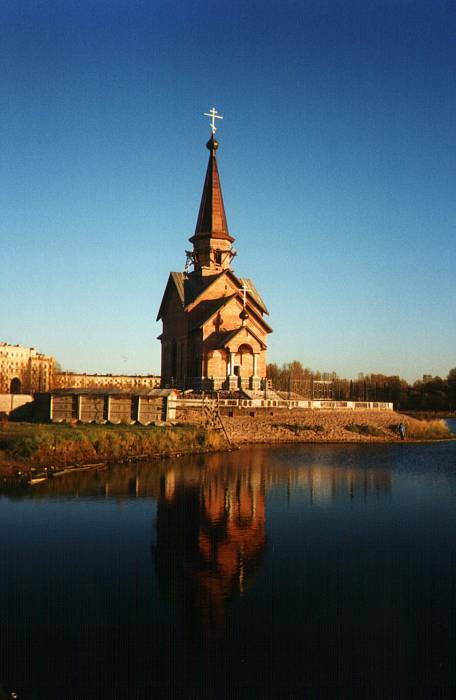 The Soviet government closed the church in 1923. It was looted, and then left to decay. 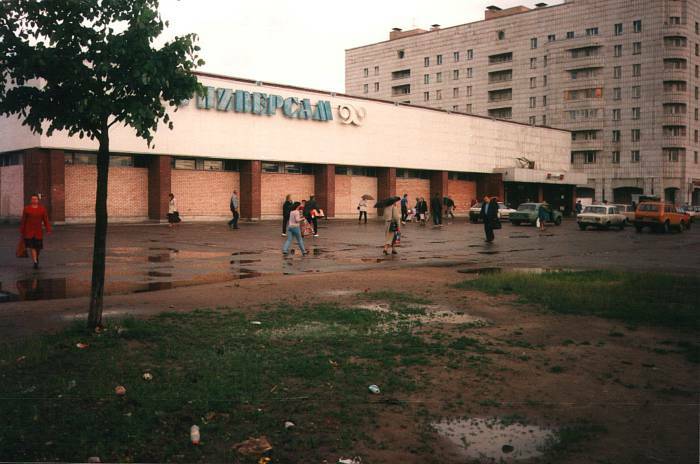 In 1982 it was restored as a concert hall. 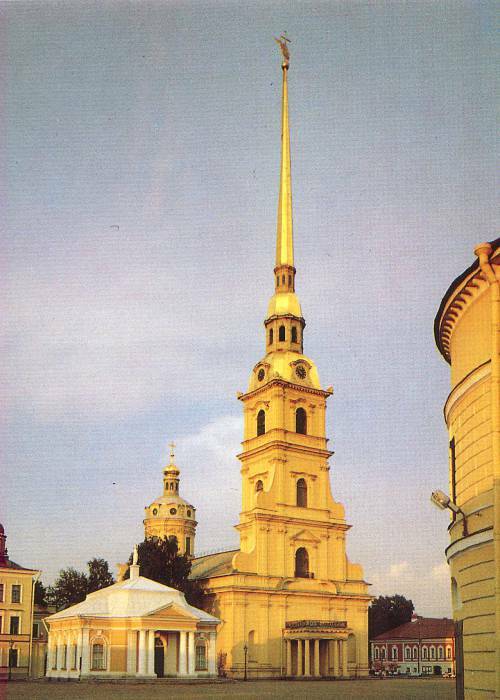 The Smolny Institute housed the home of the city mayor and city government starting in 1991. 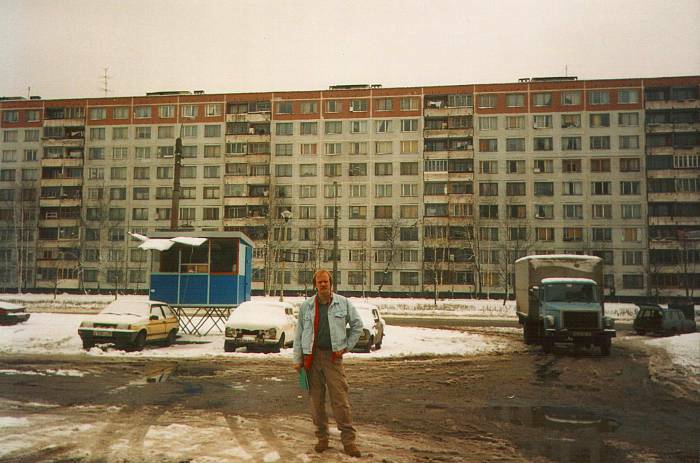 Vladimir Putin worked there 1991-1997 (when these pictures were taken) under Anatoly Sobchak's mayoral adminstration. 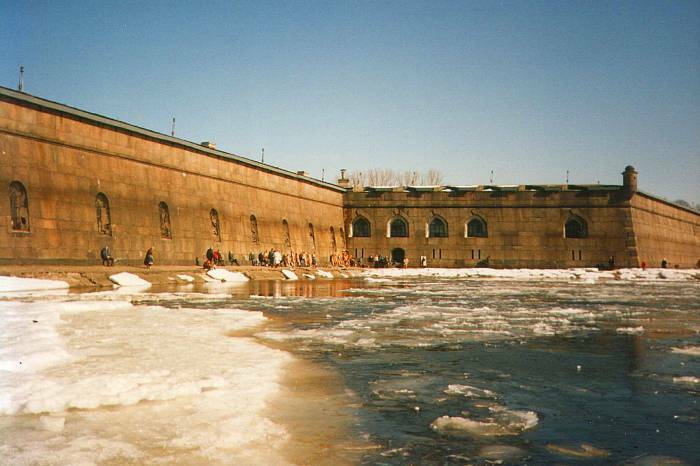 One day in March, when the ice was breaking up on the Neva River, beside the fortress. Hmmm. Look at all those people standing over there. The ice is breaking up! Time to get some sun! 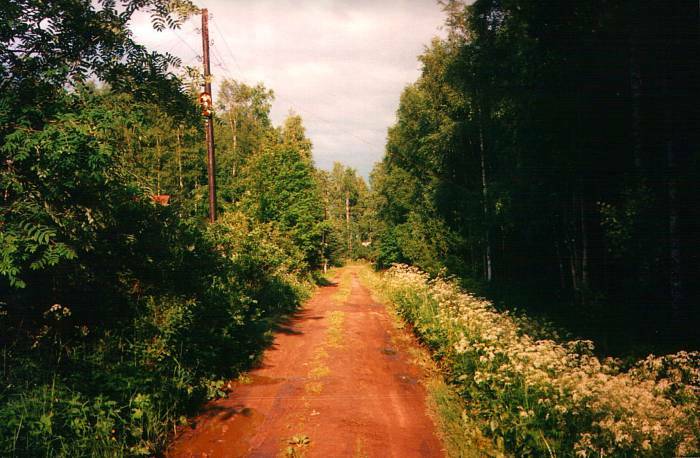 The dacha was east of the city, in the swampy woods between there and Petrokrepost. 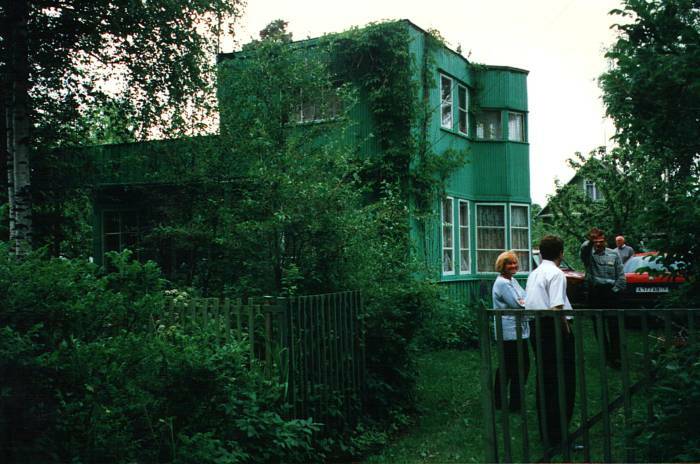 One great experience was when a family invited a few of us to their dacha in the forest well outside Sankt-Peterburg. Out of the city on a major highway, then onto a smaller highway, then a smaller road, and finally a dirt track into the forest. 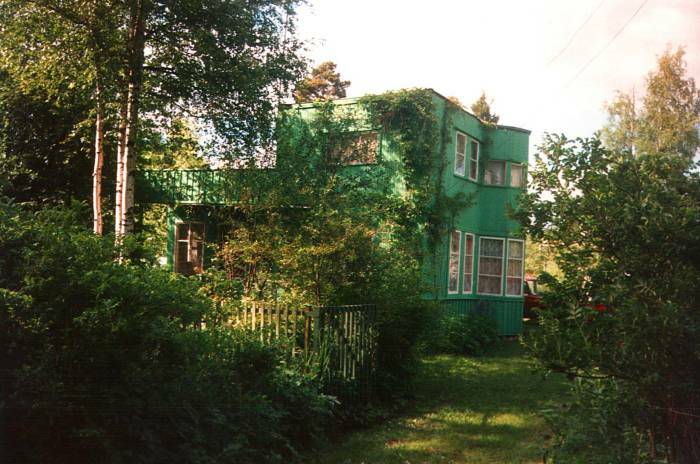 The family had built the dacha themselves, over the period of several years. 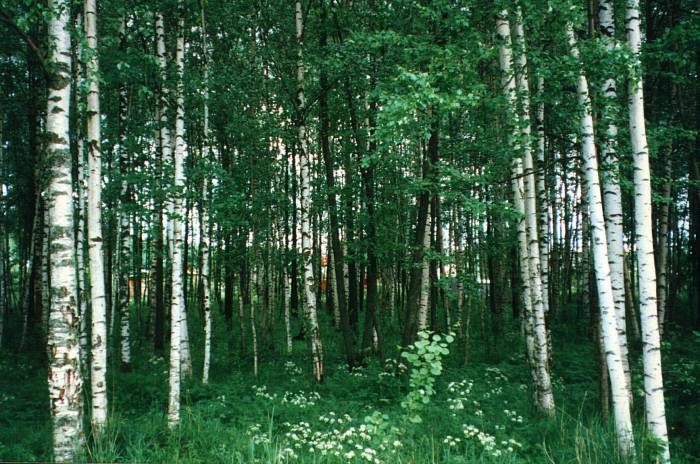 It sits back in the beautiful Russian birch forests.